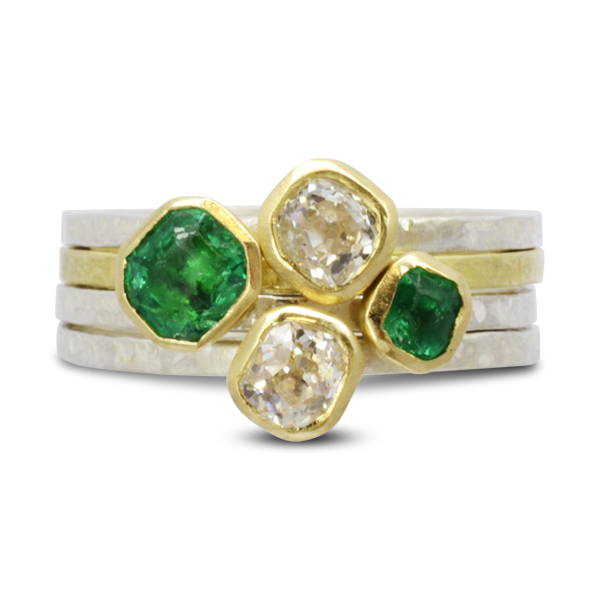 A set of bespoke Emerald Old Cut Diamond Stacking Rings. Handmade in our Sussex workshop in 18ct yellow and white gold. These lovely old cut diamonds have been give a new lease of life, emphasising their interesting uneven shape in an 18ct gold rubover setting. They are accompanied by a pair of gorgeous Emerald cut Brazillian emeralds set unevenly so that their octagonal shape blends in with the rugged shapes of the mine cut diamonds. These vintage shapes used to be disguised with elaborate metalwork but we love the effect that their organic shapes bring to a simple modern setting. The metalwork has been “rough hammered” to match.